Local bicyclists, replete with colorful jerseys and high speed, lightweight machines, will turn out in force tomorrow to compete against riders from all parts of the Mid-West in the Fifth Annual Tour of Kansas City. Post time for the 35-mile road race is 1 o’clock, rain or shine. Dennis Scott, race director, said spectators can expect to see a fast, fiercely fought race with several of the region’s top ranked cyclists participating. The race will be run on a 1.1 mile circuit in Penn Valley Park. The Penn Valley course is regarded as one of the area’s toughest because of its two hairpin curves, a breath-taking downhill decent, and a grueling uphill climb. 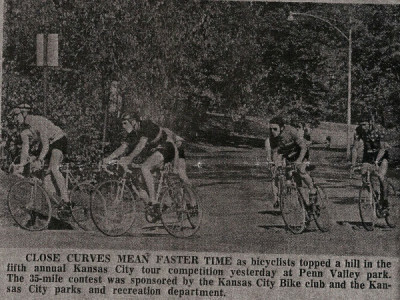 Howard Cummins, an experienced local racer who has compete in every Tour of Kansas City, says that only riders in the very peak of condition will be able to negotiate the required 32 laps at racing speed. Peak physical condition for a bike racer means a regimen of some 200-400 brisk miles each week, plus lots of sleep and strict adherence to a well-balanced diet. Riders often carry refreshments on long races. Leon Lants, another area cyclist who took fifth place for the Kansas City Bike club in the 1968 Missouri state 104-mile road championship, consumed during that jaunt three points of water, and numerous pieces of hard candy. In spite of this intake, his weight was down eight pounds after the race. Tomorrow’s bike race will span about 90 minutes, with the riders maintaining an average speed of approximately 25 miles per hour. The lead riders will be preceded by a pace car driven by Ron Boyd. Also riding in the pace car and serving as chief referee will be Norm Tate. This year’s Tour of Kansas City is jointly sponsored by the city parks and recreation department and the Kansas City Bike club. Seven senior and three junior trophies will be awarded. Both the junior and senior races will be run concurrently. Riders are eligible for junior competition until age 18. Kansas City has many bicycle racing enthusiasts, ranging from 14-year-old high school students to veteran riders in their mid-40s. Why do they race? For one, it is simply the thrill of competition while to another, it provides an exciting way to keep fit. But regardless of reason, all cyclists agree that it is a great way to see the countryside and enjoy the outdoors. Area bicyclists, whether interested in recreational riding or racing, are encouraged to observe Sunday’s race and to attend the monthly meetings of the Lewis and Clark Council of American Youth Hostels, Inc. The A.Y.H. organization, headed locally by Dave Robins, is composed of young persons and adults interested in cycling and other outdoor activities including hiking, camping, canoeing, and skiing. Monthly A.Y.H. meetings are held at 7:30 o’clock on the first Wednesday at the Westport-Roanoke Community Center, 3601 Roanoke road. The November meeting only will be held at the home of Dave Robins, 12201 Blue River road. The Fifth Annual Tour of Kansas City, a 35-mile amateur bicycle road race, will be held at 1 o’clock Sunday, October 29th, in Penn Valley park. The race is sponsored by the city parks and recreation department and the Kansas City Bike club. The bike race is sanctioned by the Amateur Bicycle League of America, an A.A.U. affiliate. This event will draw riders from over Missouri and from Iowa, Kansas and Illinois. 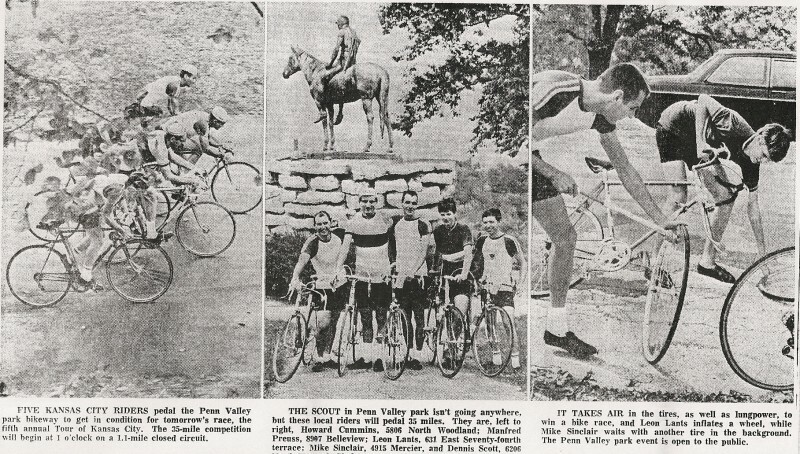 The Penn Valley course is 1.1 miles in length and has a sharp decent, a steep uphill climb, and two hairpin curves. Spectators are invited to observe the race from all points on the course. Start and finish will be a t a line just east of the tennis course s int he south part of the park. Co-chairman of the race and riding for the Kansas City Bike club are Dennis Scott, 6208 North Hoard, Gladstone; Howard Cummins, 5806 North Woodland, Gladstone, and Leon Lants, 631 East Seventy-forth terrace. Duration of the road race will be approximately 90 minutes. Speeds of upwards of 50 miles an hour are attained on the downhill run and cyclists are able to maintain a cadence of about 25 miles an hour on the level stretches. Last year’s race, also held in Penn Valley, saw 31 entrants with 19 finishing: a combination of heat, punctures and steep hills exacting their toll. The riders wear crash helmets and are preceded by a pace car. Their $250 bikes weigh about 20 pounds an are equipped with gear variations for 10 speeds. Missouri is currently at the forefront of the national cycling scene, the 1968 national road champion being John Howard of Springfield. Howard, who took third place int he 1967 Tour of Kansas City, is a member of the United States Olympic cycling team now competing in Mexico City. Youngsters ride bicycles for fun, and so do adults, especially those who turned it into a grueling sport yesterday at the 35-mile Kansas City tour race in Penn Valley park. Ray Henderson, an 18-year-old high school senior from St. Louis, finished the 32-lap race in one hour, 34 minutes, 27 and one-half seconds to win over a field of 18. Henderson, a surprise winner, said he had his sights on the 1972 Olympics. The 1.1-mile course used yesterday has a steep hill and sharp curves. 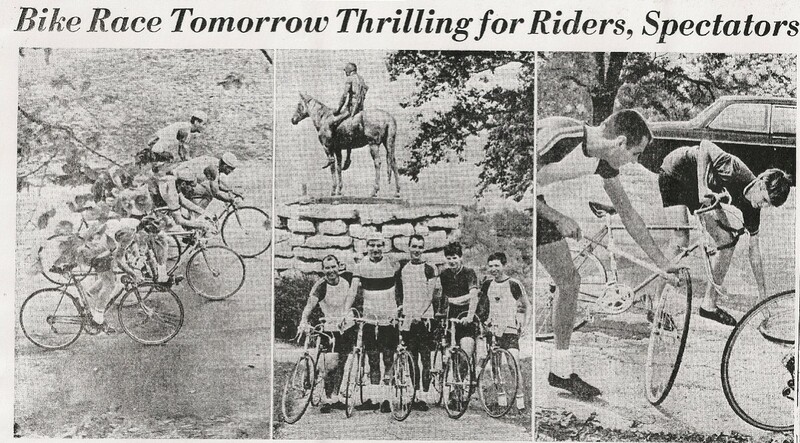 The race presupposes [some] 200-500 miles of bicycle riding a week to get competitors in shape. Even with that, the 14 persons who crossed the finish line at speeds of 50 miles an hour needed the encouragement of about 50 spectators to put forth their last energy int he homestretch. Lightweight clothing, bikes about 30 pounds lighter than ordinary vehicles, helmets and special bike shoes with cleats and straps binding the feet to the pedals are necessary equipment for the serious racer. Each bicyclist has his own strategy for winning-keeping with the pack, making the breakaway at the right time, ( . . .) container of water on the bike, as well as sugar, candy or other food in a large back pocket. And he treats his body like a jockey does his horse at the end o the race. a quick stop means cramped muscles. Racin is a pleasant way to keep in shape, the trim business and professional men who are weekend bicyclissts, believe. For some, it’s an extension of high school track and other sports. ( . . .) youngster to the oldest competitor-who would only say he was “over 45”-the demanding sport is fun. Mrs. Leon Lants, 631 East Seventy-forth street terrace, wife o a lawyer who is in his first racing year, says it’s hard to explain the magnetism of the sport, and harder to keep up with an amateur who is hooked on it. (…) don’t know how to ride unless you race. 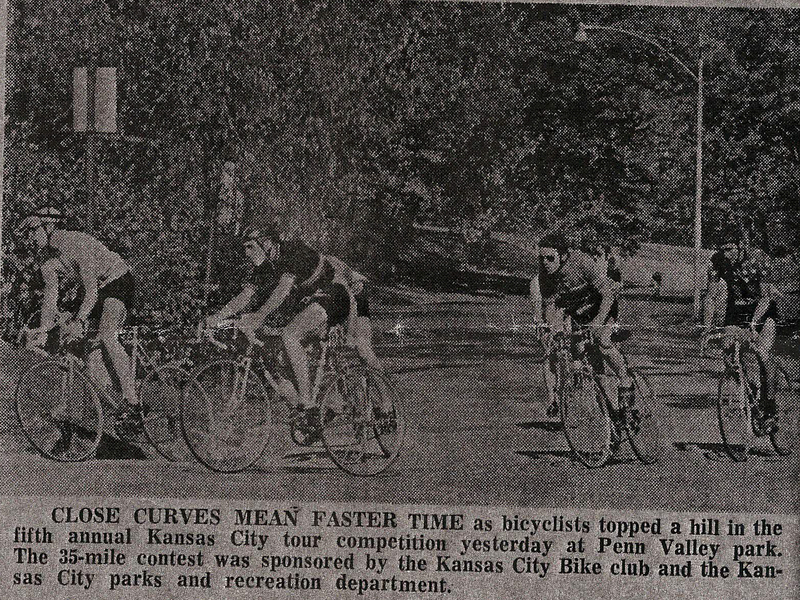 The race yesterday was sponsorred by the Kansas City Bike club and the Kansas City parks and recreation department. Senior Division -Henderson, first; Mike Carnahan, Ferguson Mo., second; Tom McDermott, St. Louis, third. Junior division -Tim Mullikin . . .